Show your love for your pet and bring them home with a Bone Large Engravable Pet I.D. Tag in Gold and Black! 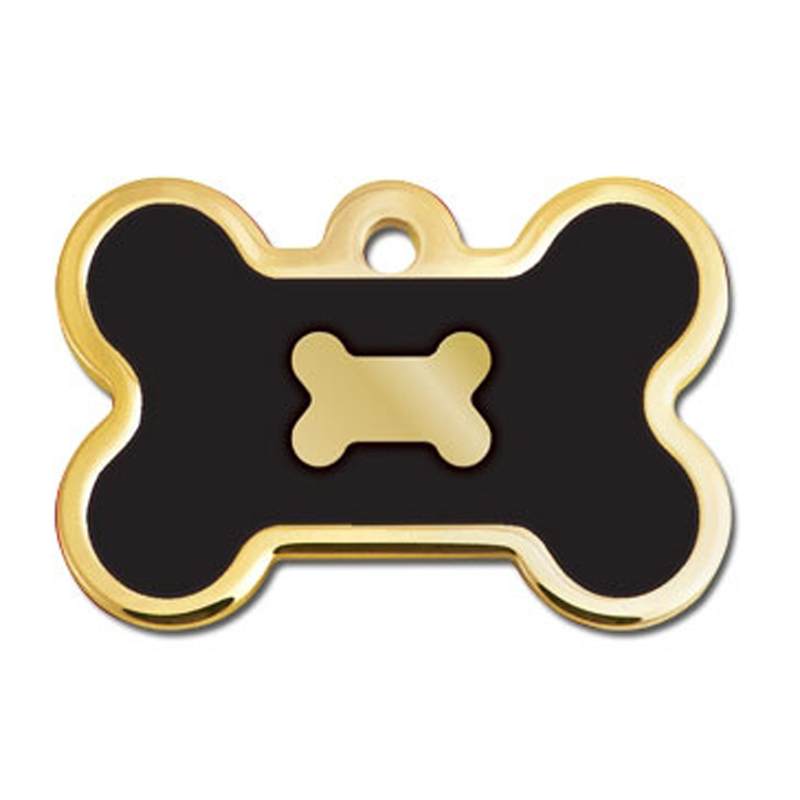 Add a designer upscale look to your dog with the Bone Large Engravable Pet I.D. Tag in Gold with Black epoxy will ship to your door, ready to use. Don't let your pet leave your house without I.D. so they know how to get back. Made with a brass plated with chrome and epoxy filled. Look for other charms to enhance your tag bling. Posted On 10/26/17 by Brittany from , AZ Yes, Brittany recommends this product! This is my second time purchasing these tags and the material/engraving is great. It doesn't scratch to the point where the letters are illegible, even after rough play sessions at the dog park. Posted On 03/14/17 by Laura M from Cincinnati, OH Yes, Laura M recommends this product! It really stands out on the collar around my dog's neck. If in the event he were to get out or lost, there would be no problem seeing he has his home address as well as 2 numbers to ensure his return. Looks great on Buddy's collar! Nice engraving with no mistakes! Allowed me to have his name, address and 2 telephone numbrrs put on. Great job with personalizing, no mistakes and love the way it looks on my dog's collar! Posted On 01/19/17 by Deborah G from Diamondhead, MS Yes, Deborah G recommends this product! Love this tag, looks great on my dog. Sturdy too. Posted On 01/12/17 by Dixie T from West Hills, CA Yes, Dixie T recommends this product! Love this ID tag! So classy and the coloring goes perfect with my Pug puppy :) Sturdy, and the engraving is clear and perfect size.